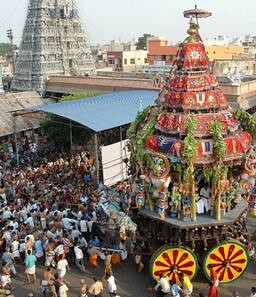 The chariot ride of the temple Deity is a special event in the annual cycle of Vaishnava festivals. Many temples in India have a large corrugated iron hangar somewhere close by. 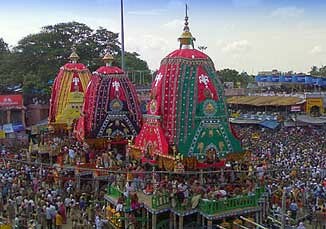 Inside, a large hand-carved wooden chariot stands waiting for the day when the Deity leaves His temple and is taken for a colourful, musical parade. 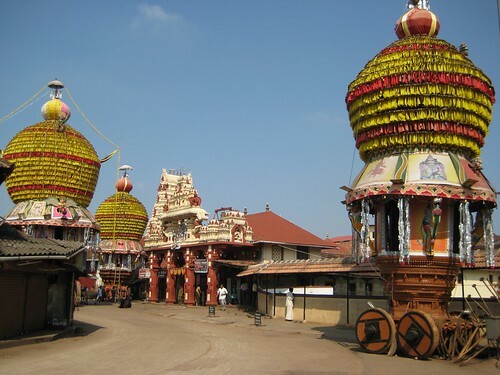 Sometimes clad in decorated silver or gold, festooned with flags and drapes of coloured silk, flower chains, jingling bells and white yak-tail fans, the chariot is slowly brought out from the hangar and established in the town square, just before the main temple gate. Hundreds of eager Vaishnavas wait patiently. Decorated elephants shift their weight from foot to foot. Then, when all is ready the Deity is invited to come out from his temple to take part in a pleasure ride with his devotees. Bestowing his merciful glance on devotees and public alike, the Lord and his Goddess move gracefully along the street. This brief journey, only an hour or two, gives everyone a chance to reflect on their own walk with God and how that spiritual journey is progressing. Brightly coloured designs are chalked out along the route, flower petals thrown at intervals; songs are sung by groups assembled at crossroads, drums thunder, and fireworks bang and crack. The Lord and the Goddess return slowly to their home within the sanctum sanctorum, soft lullabies are chanted, a lone flute is played, and the procession is complete. 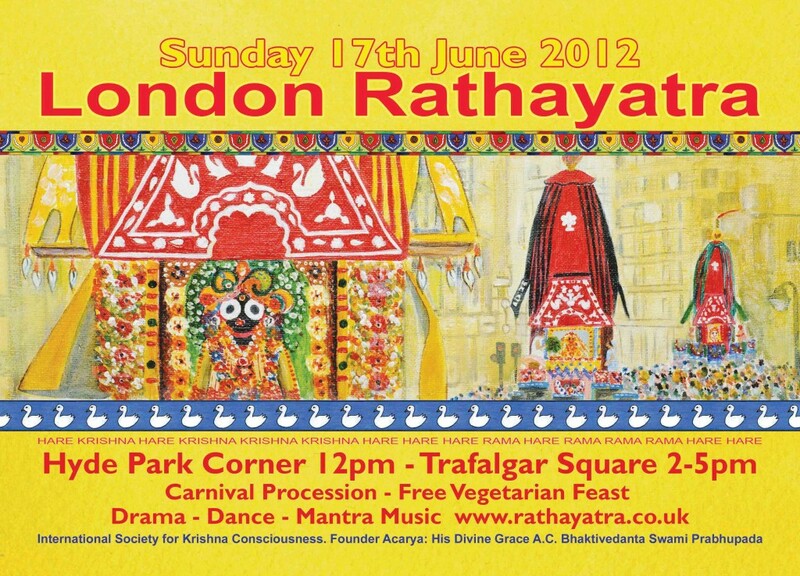 This year, the chariot festival in London falls on Sunday, 17th of June. Dear readers in Britain, and even those in other countries, please come if you can to this beautiful event; pull the ropes and bring Lord Krishna into your hearts.